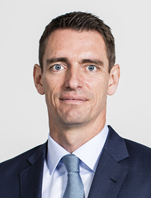 Rasmus Bach Nielsen joined Trafigura in August 2014 as Global Head of Wet Freight which includes gas, crude and products. Trafigura Maritime Logistics is the Group entity that arranges shipping and freight services to Trafigura's various commodity trading teams as well as to third party clients. Overseen by Rasmus, this business operates both as a service provider securing competitive and reliable freight for in-house oil and gas traders, and as a profit centre in its own right through trading a portfolio of leased ships. Prior to joining Trafigura Rasmus spent 15 years with various shipowners based in Singapore, Monaco and Copenhagen. He initially trained and worked in A.P Moeller Group and Maersk Tankers trading handy size and medium range tankers. Rasmus then moved to Scorpio Tankers to trade Panamax tankers primarily in the European and American markets. This was followed by a move to Singapore in 2007 where he opened and headed the office for another Italian shipowner. In 2012 he joined Navig8 Group where he was part of the team concluding more than 70 new build tankers at various shipyards in China, Korea and Japan while also assisting the Navig8 Group's equity raising efforts in Asia. A Danish citizen, Rasmus is married with two children and lives in Geneva, Switzerland.